Custom Design: ThreaDelight thread net is precut to fit all sizes of thread spools/cones from 250 yards to 5500 yards. Keep all your threads organized and neat. Thread nets are used for two main purposes - to avoid thread looping while you are embroidering, AND to stop thread from unwinding when it&apos;s not being used. Thread nets are used for two main purposes - to avoid thread looping while you are embroidering, AND to stop thread from unwinding when it's not being used. In both cases, thread nets solve the problem easily and effectively. If you are using metallic thread, thread nets are a must. You probably won't be able to embroider normally without them. Can be cut. No unraveling. 100 PIECES Thread Nets, each net is approx. 6-inch long. - Simple to Use: Thread Nets are a much cheaper alternative to the more expensive spool huggers or spool savers. Just put it on the spool like a Spool Sock. - Multiple Uses: Suitable for all home embroidery, sewing, serger, quilting machines thread spools or cones. No more sorting through an entangled mess of threads as the spool has unravelled itself and the threads have gotten mixed up. Helps to keep the tention of the thread. Very helpful with the metalic threads. Also good for Rug Hooking Strips. 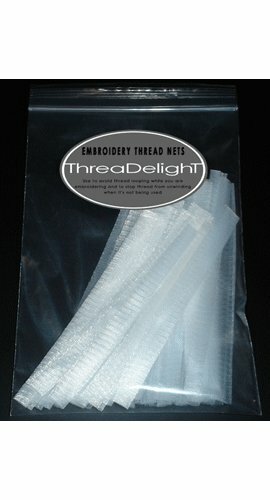 - Custom Design: ThreaDelight thread net is precut to fit all sizes of thread spools/cones from 250 yards to 5500 yards. Keep all your threads organized and neat. - Perfect Experience: ThreaDelight thread net regains its shape after being streched, they can be used repeatedly. Competitor thread nets do not regain their original shape. - Durable : These are best quality, very soft and strechable yet sturdy and durable. Will not rot or smell.